I want to thank Anna with Hachette for letting me be a part of this tour. She is also letting me give away 5 copies of this book. Must be a follower. Open to US and Canada only. NO PO Boxes. Ends. February 18th. Fashion curator Athena Smith has dreams about getting her hands on the famed Bertha Palmer couture gowns that the John Clayworth and Company empire has locked away in their Secret Closet. She wants to get the gowns and display them for all to see and enjoy. Athena is checking out the gowns when she inhales some gases. Though not lethal. The Smiths and The Clayworth’s have bad blood between them. Athena’s father was set up by The Clayworth’s and forced to take an early retirement. Drew Clayworth never imagined he would be back in Athena’s life, especially agreeing to help her figure out if someone has it out for her and her family, even if it means learning the truth about his family. 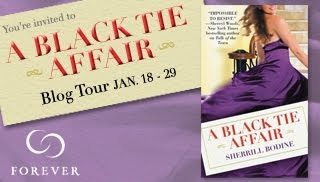 The Black Tie Affair takes readers into the fabulous and elite fashion world of Chicago. This is Athena’s story. Athena and Drew may have parted ways a long time ago but the chemistry between them is still hot as ever. I thought this was a fun, flirty story. I found it interesting that this story was based on true events that happened to one of Sherrill Bodine’s friends. Who knew that couture gowns could be killer! This book is a quick read. Though this book lost a little of its shimmer from the prior novel, Talk of the Town. I still can’t wait to read Venus and Diana’s stories. 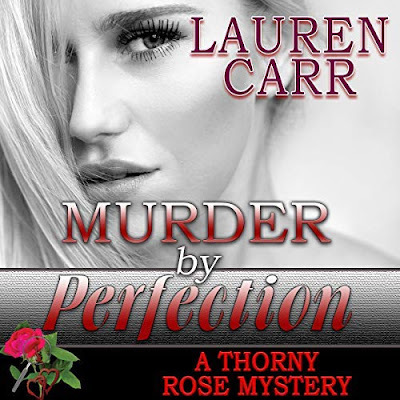 Romance fans will fall for Sherrill Bovine and her books. I’m sure growing up in my grandmother’s house, taking care of my developmentally disabled mother, forged who I am, but I don’t believe any one thing defines me. My philosophy of life is that we are all in this together—and we need to embrace one another with as much grace, humor and compassion as we can muster. I see life as big, bigger, biggest, and I want to take everyone along with me on the journey. I not only attend black-tie affairs and work on charity board projects, but I am also just as likely to be taking a grandchild to lunch and a movie. I’m happily married to John, with whom I eloped when I was an 18-year-old freshman in college. It was quite the scandal. We have four beautiful children and 11 grandchildren. I won my first writing award in the seventh grade in a statewide essay contest about a television broadcast of Hans Brinker and the Silver Skates. Instead of Silver Skates, they sent real skates, which I enjoyed immensely. I’m only sorry I don’t still have them so they could hang in my office. While moving 22 times across the country and rearing our children, I sold stories to Fate Magazine, Home Life Magazine and True Confessions. In 1988, I sold my first novel and a week later received a two-book contract from Fawcett. Sixteen novels later, I’ve seen The Other Amanda win the Wisconsin Romance Writers of America Write Touch Readers’ Award and Talk of the Town chosen by Cosmopolitan magazine as its “Red Hot Read” for February 2009. 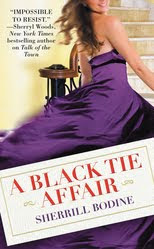 Listen to an interview with author Sherrill Bodine. Good luck all. Thanks to everyone for being long time followers. I'm a follower and I'd really really love to win this one! I liked her first book a lot.